Those of you who have had the chance to visit our mill have seen the tight quarters we work within. Our mill shop is no exception, and we like to joke that our festival booth spaces are usually more roomy than our display space back home. We wouldn’t change any of that for the world, but it does mean that we need to make the most of the space we have available. With that in mind, and with the release of our new Ragg-Time yarn just around the corner, we realize that we’ll need to make some space. So after a bit of soul searching, we’ve decided to slightly reduce the rich palette of Mountain Mohair colors we produce and display from 37 to a more reasonable 30. 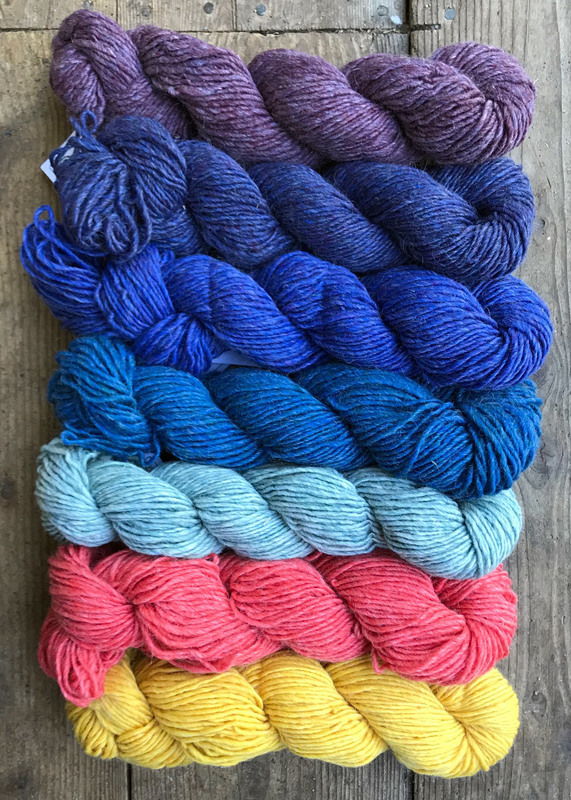 We wanted you to be among the first to know that we will be discontinuing the following seven colors of Mountain Mohair (from top to bottom): Alpenglo, Concord Grape, Periwinkle, Blue Gentian, Ice Blue, Coral Bell, and Golden Rod. It is sad to say adieu to these lovely shades. We look back on some of the garments we’ve made with these colors and love every one. We know that you have your favorites among this selection so we hope that you’ll take this opportunity to purchase quantities that will ensure you can use them for future garments before our supplies run out. With every ending there is a new beginning, and so we hope that you’ll be pleased with the fruit of our summer’s labor when we share our new Ragg-Time line next week! Previous Previous post: Sweater weather is coming!